When I was pregnant with my 2nd child, I found myself drooling over her cookbook right in the middle of the store. The photos were just beautiful. Maybe it was a weird pregnancy thing, I don’t know- but I bought the book right away. 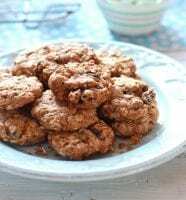 The first recipe I tried were her oatmeal raisin cookies. They’re made with nutritious spelt flour and brown rice syrup. 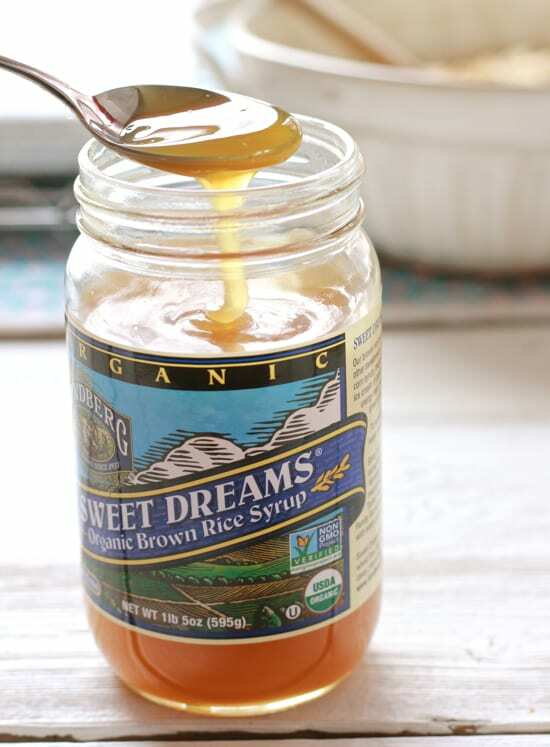 If you’re unfamiliar, brown rice syrup is a thick, all natural sweetener usually found in baked goods (i.e. chewy granola bars). The flavor is rich and buttery tasting. Speaking of butter, this recipe is butterless. No eggs either. It’s a vegan cookie. They must taste like tree bark. When I think back to when I bought the book, it wasn’t a weird pregnancy thing afterall. I was going on instinct. I’ve made several of her recipes with great success. These cookies are a big hit! * If this is your first time making this, stick with the original version (below) before making any adjustments. Sometimes vegan recipes are not as flexible with substitutions. I’ve tried almond flour, gluten free flour, agave syrup etc. and still find that Gwyneth’s version has the best texture and flavor! Recipe adapted from ‘My Father’s Daughter’ by, Gwyneth Paltrow. Edit 2/10/13: For a twist, try adding 1 (mashed) overripe banana to the recipe. I made a batch like this and they were devoured in minutes! Preheat your oven to 350 F. Line baking sheets with parchment paper. In a small pan (without oil) toast the walnuts until golden brown and fragrant. Stir constantly so that they do not burn. Transfer to a bowl an set aside. Place the raisins in a small bowl and cover with water to plump them. Meanwhile, finely grind the toasted walnuts and ½ cup of the oats in a small food processor. Combine this mixture with the remaining dry ingredients in a large bowl. Mix together the wet ingredients (and banana if using) in a small bowl and add to the dry-ingredients bowl. Stir to combine. Drain the raisins and fold them into the batter. Drop the mixture using a small cookie scoop or tablespoon onto the baking sheets. Bake for 13-15 minutes or until lightly golden. Previous Post: « Vote for Me! I’ve never made these cookies gluten-free, so I’m not really sure how they will turn out! The texture & flavor will all depend on the specific types of gluten-free flours you use. We’ll have to experiment with this! However, this recipe contains spelt flour, which is lower in gluten and easier to digest than regular white flour ( maybe you can convince your daughter!!!). Also, I recommend adding 1 (mashed) overripe banana to the recipe. I did that this morning for the first time and it was a big hit!!! If you have trouble tracking down brown rice syrup, check out your local health food store. They should have it! When combined with the other ingredients, it makes these cookies taste buttery! No problem. Hope you like the cookies :) Thanks for stopping by! Right? That’s what I thought when I first made them. And the addition of banana made them even better :) I’m having fun playing around with the brown rice syrup- it’s so rich and decadent! Wow, these Vegan cookies do sound amazing! I loved this cookie by Gwyneth. Now I’ll have to get this book for more amazing recipes! Well done on your part. the cookies look fantastic and loved your presentation. Hi Purabi! 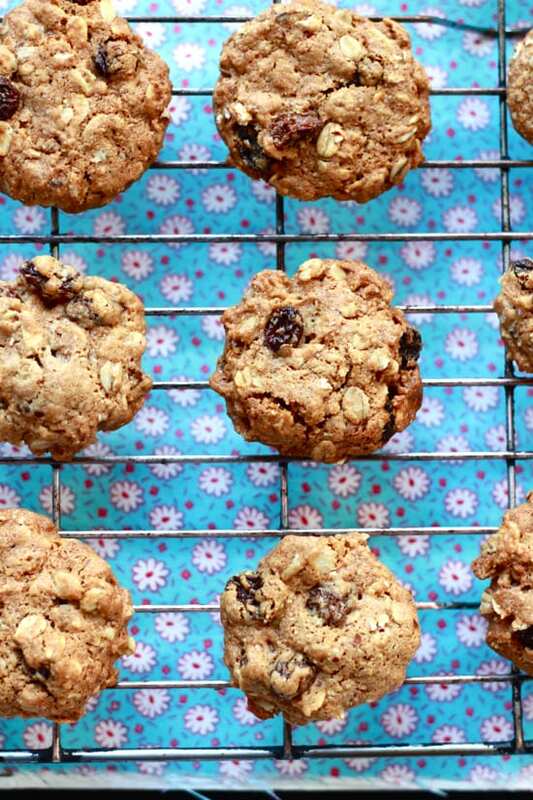 These cookies are super yummy (and healthy too!). Gwyneth’s book is great. So far I’ve made all of her muffin recipes, vinaigrettes, mushroom burgers and salads. I highly recommend! These certainly look delicious! The slightly nutty flavour of the spelt flour must work wonderfully in this recipe. Hi Ronja! Absolutely- the spelt flour adds a nice nuttiness combined with the ground walnuts. The flavor is great! Gosh, I’ve never heard of brown rice syrup -I’m intrigued, will have to seek some out!! These cookies look lovely and your photography as always is so beautiful, thanks for sharing Emilie! Could I substitute brown rice syrup for honey? These look and sound so delicious – I love how thick they are! The addition of a banana sounds great as well. Hi there! Thanks so much! These cookies are a great treat when you’re in the mood for a little something sweet. My kids go crazy for them. I love the addition of banana too- it adds a nice touch! I think I’m going to permanently make them with banana now :) Thanks for stopping by! I love these too, and have been making them for several years. One day I was out of brown rice syrup and used agave nectar, I ended up preferring them. Hi there! 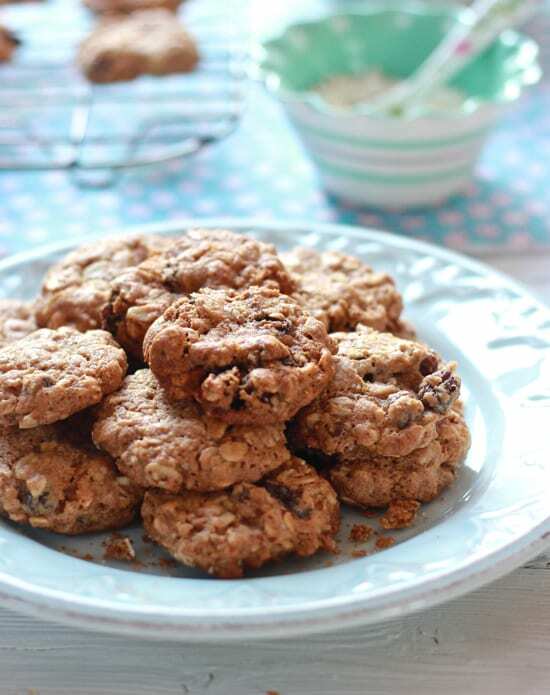 I just made these cookies and they come out perfectly- perfectly risen, light and crunchy! I think they will become a regular snack for me to whip up for the week! Thankyou! No need to apologize, it’s a great question. White spelt flour is similar to regular all-purpose flour. Whole spelt flour is similar to whole wheat. Keep in mind, they are not exact in terms of their similarities but can be used as substitutions when necessary. 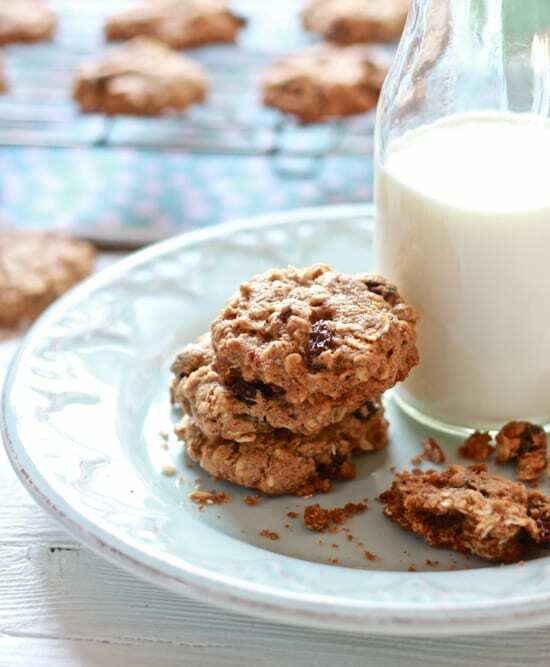 I just made these after searching google for a naturally-sweetened chewy oatmeal cookie recipe (pregnancy cravings :) ), and they’re fantastic. So glad you shared this recipe, Emilie. These are a seriously delicious cookie. I bought the book from a thrift store and I have not been able to beat these cookies. We have an anzac biscuit here is Australia and Gwyneth’s cookie is the best cane sugar free version of oat biscuit that I can find. Thanks for sharing and reminding me when I was too lazy to get the book down.